This nightstand with cutout kickplate will give your bedroom a contemporary and neutral look. In order to maximize bedside storage it features two drawers decorated with elegant metal handles and an open area at the top. With a sturdy table top suitable for a lamp, cell phone and glass of water, the bedroom cabinet has an open space in the back for easy wire management. 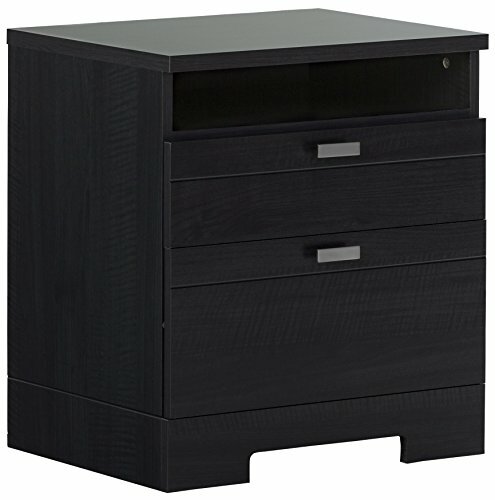 Featuring an open easy-access storage space ideal for bedside reading materials, the bedroom nightstand also includes 2 convenient and practical drawers with smooth metal drawer slides and durable metal handles. The shallower top drawer is the perfect place to store smaller personal items, while the slightly deeper bottom drawer is suitable for clothing or accessories. Shop with confidence knowing that we proudly stand behind this nightstand with a full 5-year limited warranty. Assembly is required. Accessories are not included. Packaging tested and certified to reduce the risk of damage during shipment. We recommend 2 people to assemble. Tools are not included. The back is open for wire management. Made in North America with certified Environmentally Preferred laminated particle panels. South Shore Furniture's support team is available 7 days a week if you have any questions. BEDROOM STORAGE: Keep your books, eyeglasses and personal items organized and out of sight at your bedside with this elegant and practical nightstand. CONTEMPORARY STYLE: The bedside nightstand features modern design with clean lines that will blend with any bedroom décor or furniture. LIFESTYLE FURNITURE: The nightstand's 2 deep drawers are finished with a convenient open storage compartment for books above and an open back with cable grip for easy wire management.